Did you know that the root of Jatropha Multifida is used in traditional African medicine to treat pain, fever, infection, inflammatory conditions, tumours and diseases? Vol.17 No.3 of Journal of Applied Sciences and Environmental Management includes "Chemical Characterization, Anti inflammatory and Analgesic Properties of Jatrophia Multifida Root Bark" by Falodun et al. This study evaluates the effects of different doses of the menthanol root bark extract. 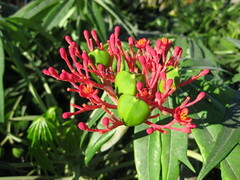 The results suggest that Jatropha Multifida does have anti-inflammatory properties. For the complete study as well as other articles from this issue, click here.